Governor Andrew M. Cuomo today announced the beginning of camping season in New York this Memorial Day weekend. The Governor encouraged New Yorkers and visitors to visit parks, trails and beaches throughout the Empire State this summer, including New York&apos;s 119 campgrounds that open Friday, May 26 for the summer season. Williamstown, N.Y. - Outdoor enthusiasts can learn winter survival skills and the basics of winter camping while exploring the grounds of Camp Zerbe at the second annual Base Camp Oswego County, a winter outdoor expo, Saturday, Feb. 25.
dignitaries for the announcement. The announcement was followed by a paddle led by Mayor Noble on the Hudson River and Rondout Creek. Albany, NY -The Hudson River Valley Ramble kicks-off this Saturday with a weekend full of activities and continues throughout September with more than 200 exciting outdoor adventures across New York&apos;s Hudson Valley. The Ramble showcases the region&apos;s incredible scenery, history, natural resources, and recreational opportunities and features walking tours, hikes, paddles, bike tours and many other diverse experiences with something for everyone. Franklinville, N.Y. - John and Jennifer Tinelli, owners of Triple R Camping Resort and Trailer Sales, a full-service 220-site campground in Franklinville, N.Y., are proud to report that they have attained a perfect rating for their campground by the Good Sam Club. Their current rating of 10/10*/10, for facilities, bathrooms and recreation, stacked with high ratings for campground management and operations in the Good Sam system seven years in a row, puts them in the top one-percent of over 14,000 Good Sam-affiliated parks across the country. Adirondack Region, N.Y. - From forest bathing - a Japanese practice that aims to boost health through immersion in nature - to sampling locally made microbrews during a beach festival, the Adirondacks of Northern New York offer enriching, unique and thirst-quenching options to enhance any visit. organizations for their outstanding dedication, commitment and support of the thousands of children and families served by Camp Good Days and Special Times over the years. Adirondack Region, N.Y. - Whether it&apos;s on your bucket or your ‘I&apos;m-not-too-sure-about-this&apos; list, camping is a must for summer adventure in the Adirondacks. Luckily, New York&apos;s six-million-acre park provides hundreds of campgrounds, each offering unique amenities, breathtaking views and access to endless opportunities for fun and entertainment. 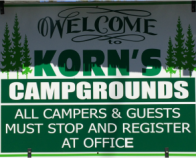 Middletown, N.Y. - Korn&apos;s Campgrounds, located at 60 Meyer Road in Middletown, invites players to register for its 5th and final annual Korn&apos;s Horseshoe Tournament, to be held Friday August 1st and Saturday, August 2nd, at the campground.